Hot on the heels of my first Shadow novel, PARTNERS IN PERIL, I have now read my second, THE SHADOW UNMASKS. And I loved it just as much. In order to kick start my Shadow experience, I decided to listen to the new productions at Audible Studios. They feature a main narrator and multiple voice actors for the cast. Both I’ve heard are fantastic and recommended. As a result, however, I’m reading these Shadow novels out of order, which means what I learned in UNMASKS surprised me. Up until now, I’ve always thought The Shadow was, in fact, Lamont Cranston. If my memory serves me, that simple one-to-one equation was on the radio shows and it certainly was on the Alec Baldwin movie. As I started in with UNMASKS, I was expecting the same, and it started out that way until the story took an interesting turn. The main plot of UNMASKS involves a crook named Shark Meglo (great name!). He and his gang have a straightforward plan: find, attack, and kill the buyers of some rare and valuable gems before the buyer can utter the name of the seller. For you see, the master crook behind the entire operation recycles the gems in new settings. Every three weeks or so a new member of the wealthy class dies. All of them had recently purchased gems. Naturally, the story begins with the most recent murder. The Shadow tries to thwart Shark’s evil plans…but fails. He learns vital clues to what’s going on, however, information needed to prevent the next death. But a distant accident lands on the front pages of New York’s newspapers. A plane accident in England injured a few Americans. The story not only listed the names of the individuals but splashes their photos. There, for all to see, is the real Lamont Cranston. The problem is, especially if you are police commissioner Ralph Weston, who reads the newspaper standing outside the Cobalt Club, is that you are literally talking to Lamont Cranston. Only it’s The Shadow in his disguise. There follows a fun subterfuge as the Agents of The Shadow basically try and convince Weston that he didn’t really see Lamont Cranston but Cranston’s nephew. And the commissioner bought it. The odd turn the story took for me was when Kent Allard, famed aviator who crashed in the Guatemalan jungle a dozen years ago, has made a reappearance. He arrives in New York to great fanfare and very quickly, we learn Allard is really The Shadow. And, lest anyone (me included) wasn’t hip on how it all shook down back then, The Shadow visits the house of an old ally, Slade Farrow (another great name!) and reveals his true identity, complete with the entire background. The reasoning is spot on—The Shadow uses the identity of Cranston as long as Cranston stays out of New York—but I couldn’t help wondering how many times in this series and, of course, the comic book masked heroes, that the characters revealed their identity to others. 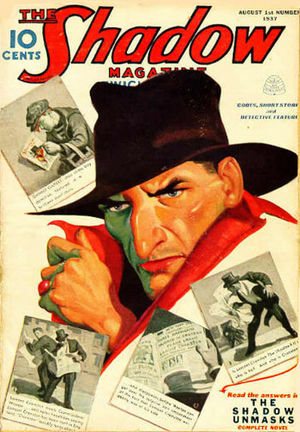 It also makes me wonder if, after this August 1937 issue (number 131 overall) if Lamont Cranston was ever used again. Long-time readers of The Shadow: please let me know. Anyway, after that startling revelation, the story continued until the inevitable end. Two things struck me about this ending. One, the big finale was somewhat low key. I guess you can’t have every novel end in a big shoot-out or something. The second thing was that The Shadow is very much like Sherlock Holmes in that he knows the likely ending far in advance and just moves the various chess pieces along the way, usually with his agents none the wiser. I’ve now read two Shadow novels and I’m not gonna stop now. They are a blast. And, as a lifelong Batman fan, I’m really fascinated to research more in depth how Bill Finger drew on his love of The Shadow and helped shape the Dark Knight Detective. So, fellow Shadow fans, where does this story rank in the all-time list?